We are a professional alternative health center that is spacious, comfortable, peaceful and clean with warm surroundings for a healing and stress-free environment. Combined with traditional and modern health care technique and products, we offer a systematic health-improving solution. We treat illness and provide health maintenance to prevent the occurrence of diseases using acupuncture, herbs and nutritional therapy, massage therapy, colon hydrotherapy, spinal care, skin care and health product resells. We also do it from various aspects in intake–water, oxygen, nutrition balance, and in outtake–body detoxification, facial rejuvenation and treating skin conditions from the inside out. 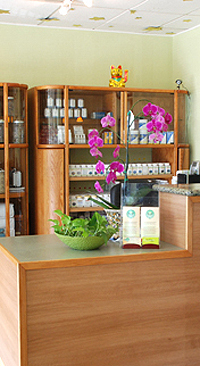 We use only natural and organic products for our services. Our professionals will evaluate each client for his/her unique health situation and make a customized treatment plan by selectively combining our services, programs and products and making adjustment accordingly with individual’s health situation change to achieve the best possible health improving results. We are dedicated to help you to have a healthier spiritual, psychological and physical balance, to look better, to feel better and to be healthier.